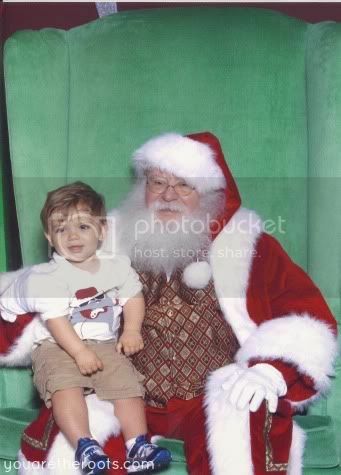 Ethan's Santa picture this year was a surprising success! My husband predicted tears, I was convinced we'd get an unsure stare -- but we got a sweet little smirk (and one grumpy Santa!) and so this year's Santa picture was a success! With Santa pictures under our belt, it only means one thing: the holidays are officially here. 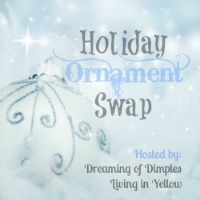 I figured there was no better way to get in on the holiday spirit than participate in a wonderful ornament swap hosted by Dreaming of Dimples and Living in Yellow. The swap was unique in the sense who you sent an ornament to was not who sent one to you, so you really had the opportunity to make some new friends and spread some Christmas cheer! Ethan and I got our ornament from Lauren at Pink On The Cheek. 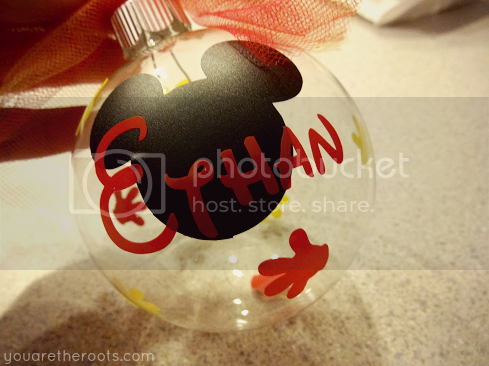 It's a beautiful glass ornament handpainted with Mickey Mouse ears and Ethan's name. Lauren must be some kind of mind reader. 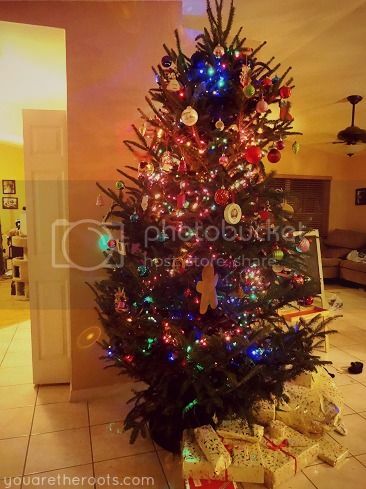 See, when I made my post about choosing our tree, I showed off some of our ornaments and said how much I love getting a new ornament each year. I hadn't done that yet for 2012 and was feeling a little sad about it until this beautiful ornament showed up! Thanks to Lauren, Ethan's wonderful 2012 is now represented proudly on our tree. 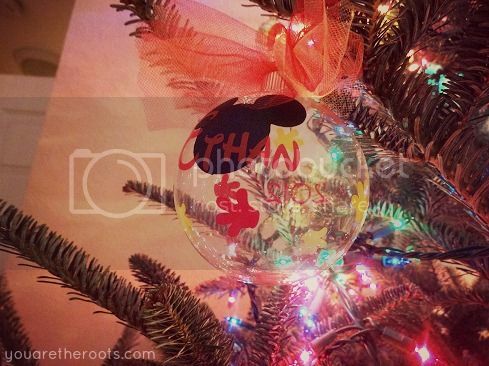 Even better is that Lauren incorporated Mickey Mouse into our ornament! You see, we had plans to take Ethan to Disney World this Christmastime but it just didn't work out what with scheduling. It was a little disappointing, even though we made plans to go after the holidays are over this year, perhaps in the spring. Like I said, Lauren must be a total mind reader because she brought Mickey to us this year! Thank you, Lauren! 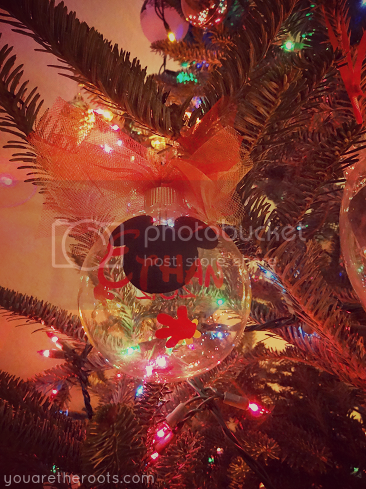 The ornament looks beautiful on our tree! oh my, ethan is so sweet! I can't even get joey to even agree to go see santa and last year was a crying fest the moment i sat her on his lap. 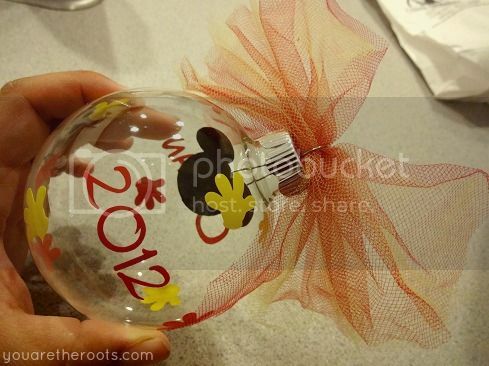 The ornament swap is such a great idea! 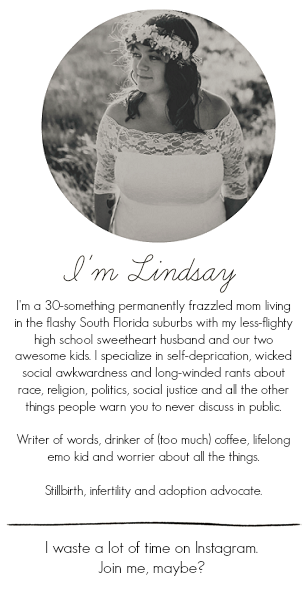 another neat way to meet more bloggers. I wonder how she'll do at Ethan's holiday party with Santa! Haha. I was SURE Ethan would be terrified, he's scared of everyone and everything! Maybe next year will be Joey's year! What a cute ornament! So sweet!! We had so much fun with this swap!! Thanks so much for stopping by our blog. It was such a fun swap! Aww, exactly that! I can't wait to save up ornaments for him for each year ever. Such a thoughtful ornament! what a great ornament! thanks for stopping by the blog and leaving a comment :) LOVE your blog! AWWWWW he's so cute, I wanna pinch his cheeks! Great blog, would you like to follow each other? This is very adorable and I like the picture with Ethan and Santa. Great pics especially the one with the tree. Thanks for stopping by my blog! And that ornament is SOOOO cute! I love it - and you had a very perceptive partner! Such a happy (non-crying) Santa photo. 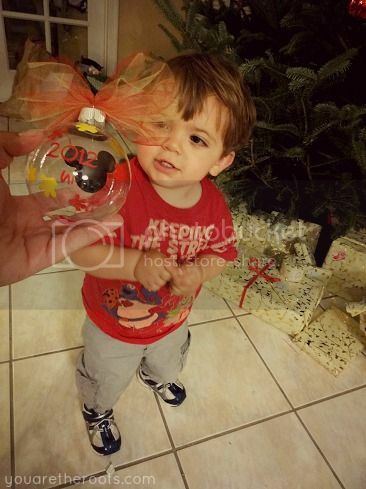 Ethan is such a cutie..and the ornament idea is awesome. 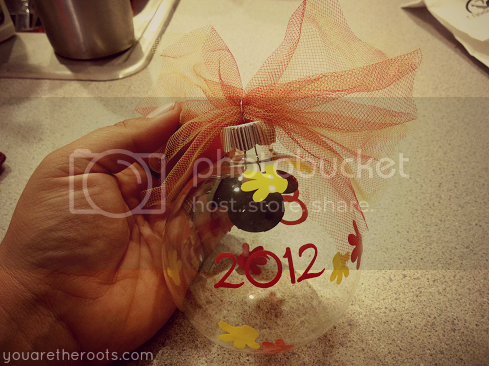 Your ornament from the swap is adorable! !